The Global Router MB7900 is the world's first universal 3G cellular embedded system which can serve as a gateway/bridge that links all Third Generation Cellular (3G) networks and LAN networks. This innovative Universal 3G mobile wireless gateway connects any Serial, USB, and LAN devices and sensors to the ubiquitous broadband third generation (3G) cellular network for wireless Internet access with up to 7.2 Mbps peak speed. 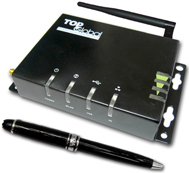 The MB7900 is software configurable to support all cellular standards including GPRS, EDGE, UMTS, HSDPA, HSUPA, CDMA 1x, EVDO Rev.0 and EVDO Rev.A. The same design, it supports multiple bands including 850Mhz, 900Mhz, 1900Mhz, and 2100Mhz and works with all carriers around the world. This enables enterprise customers to deploy one product with different software configuration and firmware worldwide.